"Researchers around the globe, including Australia, the U.S., Scotland, the Netherlands and Germany, are listening in on the vocalizations of B.C. 's solitary orca, who surfaced in Nootka Sound four years ago." "The bottom line is simple. Luna is a member of an endangered species, and as such deserves stewardship and understanding. History has shown that we don't often get a chance to set things right with nature, and yet we have at our fingertips one such rare occasion." "Above all else, the Mowachaht / Muchalaht First Nations people want to see Luna free. Free to reunite with his family naturally. Free from capture, free from sea pens, free from dorsal tags, and in the most extreme case, free from a life of captivity in a public aquarium. " of hundreds of dolphins "Scientists don't have any answers yet as they struggle to find out why hundreds of dead dolphins washed up on a tourist beach in Tanzania. 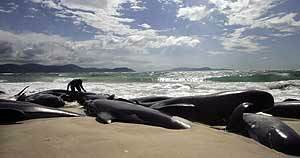 But some marine biologists are pointing to the use of sonar by the U.S. Navy as a factor in the deaths." for 130 dead whales "Up to 130 long-finned pilot whales died after being found beached at Marion Bay, east of Hobart, early on Tuesday and early yesterday, said Tasmania's Parks and Wildlife Service. The Royal Australian Navy said two mine countermeasure vessels were in North Bay, south of Marion Bay, between Tuesday and yesterday." 05/10/22 Navy moving ahead with sonar range proposal "Less than a year after three dozen whales beached themselves along a stretch of North Carolina shoreline, the Navy is proceeding with plans for an underwater sonar training range off the state’s coast. The proposed range – the first of its kind on the East Coast – would be used as often as 161 times a year, according to a draft environmental impact statement released this week. 05/10/20 LA lawsuit claims Navy sonar beaches whales and dolphins "The Navy's most widely used form of sonar is disturbing whales and dolphins, even driving some to their deaths, according to a lawsuit filed by environmental groups. 05/10/19 Navy sued over harm to whales from mid-frequency sonar "Ear-splitting sonar used throughout the world's oceans during routine testing and training by the United States Navy harms marine mammals in violation of bedrock environmental laws, according to a lawsuit filed here today in federal court. Read the full text of the active sonar lawsuit here. 05/10/06 ‘Leave Luna Alone’ Scientific Panel said. "Documents show people within DFO were concerned the Luna reunification plan was ill-fated, and Tsu’xiit was destined for captivity, or worse. 05/10/06 Tsu’xiit’s close call with captivity "Nootka Sound’s famous killer whale was close to becoming an aquarium exhibit, according to documents obtained by Ha-Shilth-Sa under the federal Access to Information Program (ATIP).